It has been some decades since I last cycled in Belfast. 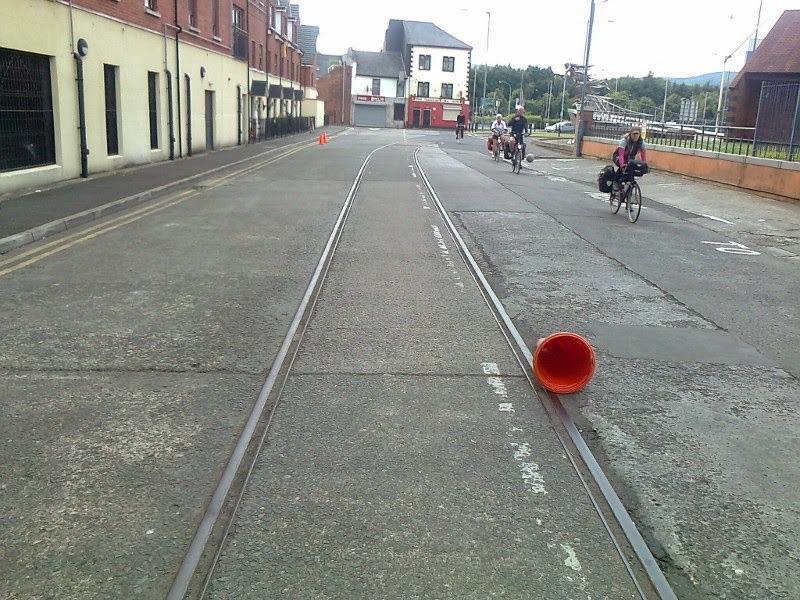 As a teenager I regularly cycled into Belfast to my summer job during the school holidays. Many things have changed, the heavy security presence has now thankfully been consigned to history, but many of the older once familiar buildings have been swept away, in the planner's vision for a brighter, more modern city. One of the new things that stand out as unfamiliar to me was the public art which is displayed either on cycle route NCN9/93 or close to it, as it traces it's course along the northern bank of Belfast Lough/River Lagan into Belfast. The first piece of sculpture I came across by accident, when I cycled down towards the Harbour entrance from the direction of Fortwilliam roundabout. There is a large silver seahorse displayed on a plinth. The seahorse is represented on the city of Belfast's coat of arms and is a testament to Belfast's maritime role as a major Irish seaport, as well as a former centre of shipbuilding. Anyone familiar with the old Belfast Corporation trolleybuses/buses will remember the seahorse from the crest on the side of the vehicles. Belfast by the late 19th Century boasted three shipyards, with one, McIlwaine & Coll having closed by the turn of the 20th Century. The second to close was Workman Clark in 1935, with Harland & Wolff still surviving today as a ship repair and marine engineering business. Part of the former shipyard Harland & Wolff shipyard is now probably more famous for the production and filming of the TV series 'Game of Thrones'. The next sculpture is also beside the Dock Street entrance to Belfast Harbour in Princes Dock Street. It is located at the side of the Harbour gate and represents the bow of a ship complete with a figurehead. It is easily missed and I have to say that I didn't notice it on my ride into Belfast. I only really noticed it on my ride back. Another interesting feature of Princes Dock Street is that there is also another tangible reminder of Belfast as a major port. There are still some of the harbour railway lines in the road surface. Many of the harbour roads also had rails, as much of the freight going in and out of the Harbour was moved by rail. These lines would have been originally worked by the Belfast & Northern Counties Railway on behalf of the Belfast Harbour Commissioners. Those on the other side of the River Lagan would have been worked by the Belfast & County Down Railway. Princes Dock Street leads down to a gateway giving access to Clarendon Dock. At the back of the Clarendon Dock building and twin graving docks stands a large sculpture of a set of ship's dividers formerly used in navigation in the days of paper charts. The sculpture stands in square between the two entrance gates to the the old graving docks. The older buildings are cheek by jowl with new corporate development. This modern style of architecture in my humble opinion lacks any of the panache or architectural statement of the older Victorian buildings. Beside the Lagan Weir and near the Custom House is the last and biggest sculpture along the cycle route into Belfast - Belfast 'Bigfish'. This was the first piece of sculpture that I was aware of and has been there since 1999 and even has it's own Wikipedia entry! The most striking new sculptured building to appear in Belfast is the Titanic building on the south bank of the River Lagan. The building when viewed from certain angles is meant to represent the bow of the ill fated White Star liner RMS Titanic and is probably the best Titanic exhibition in the world and a fitting memorial in the city in which she was built and launched.